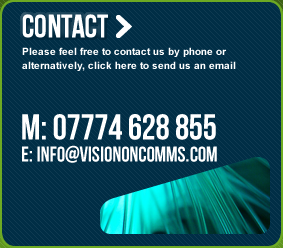 Vision On Communications has a range of services to maximise the productivity for businesses going forward. We work in an ideas culture and pride ourselves on coming up with the right formula to fit each firm. We also make TV documentaries as and when commissioned. Our aim is to promote your brand where it matters. We target the relevant media outlets. This may be through carefully tailored press releases or longer feature articles. You may need a business article to promote your presence online or a regular newsletter for your client database. We work with you within an ideas based culture to decide on the best strategy. Our specialist photography is highly regarded and can be used alongside any of the above categories or commissioned on their own. We want to make you feel more confident about how to get the best out of the media opportunities available and how to cope with tricky interviews if needed. Our courses are bespoke and can incorporate crisis management and presentation training too.